I’m all about the downward slant ! How can you not be with a user name like that! Don't know about better, but it certainly has a tonal effect. Yes, Andy is great and has some interesting explanations and Troy's work is fantastic. No idea what you sound like, pictures mean nothing to me. As soon as people start talking pick slanting I start yawning, Troy's work is great ? Well anyone how can spend half an hour pretending there is a mystery surrounding a four note repeating riff and can keep a straight face whilst every guest contradicts him on how productive worrying about pick angle must have some clear ideas about his ideal customer. I wish he was as interested in how people place the down beat as he is in pretending that his ridiculous system is worth talking about. Looking at slo mo videos, ridiculous graphics, ridiculous dissertations on 'pick slanting'. slowed down wave forms and pretend mystery mongering are all great things to do while you avoid practicing. But if you are getting to practicing I recommend you use your ears. If they aren't good enough to help then find someone with better ears to help you out, in the real world where you can both be in a room together playing and one of you at least can hear what is going on. I wrote a rather thorough description of how to pick once, some hilarious missing the point ensued. Now we have discussions about pick slanting. Trivial, wrong headed and playing into some very slippery hands. Well I find Troy's stuff interesting and still find time to practice, it doesn't have to be either or. Everyone internalises stuff in a different way so what you deem worthless might be a revelation to someone else. I've had conversations with great players who consider aspects such pick slanting and others who don't think in those terms at all. Different strokes and all that. I can get a fair sound from a students guitar as i face them with any finger of any hand either with or without plectrum or nail. Anyone can, you just need to feel the string and strike it with the same attention you might give to the scruff of a puppies neck. I am afraid I haven't the expertise to prepare slow videos showing my wrist angle and 'puppy slanting' but believe me all you really need to do is pay attention. Feel=listening/paying attention/being in the moment etc. Pick angle talk is a distraction and generates nuisances with phony expertise and professionally produced videos with unmeasured tab. Thatstabthatlookslikethis,act uallym or elikt his. Adrian Holovaty is doing amazing work with Soundslice if you want to watch some experts playing and he is also a thorough and accurate transcriber . Sorry I'm just not happy about some joker turning one Frank Gambale video into a hundred plus hour long education free cynical exploitation of the fact that guitarist don't listen to their bodies, their guitar, real teachers or their puppies crying. Boy they love pictures of guitars and ooing and aahing at slow motion videos. No harm to you Shem, but this new trend in 'edutainment' is the worst sort of scam to get money for old rope. They tend to be outrageously lacking in any musical depth. Tab is presented with no rhythmic groupings or bar lines. I can see the temptation for beginners to focus on this rubbish though, it allows people with no musical vocabulary or insight to talk about guitar as if looking at stills could teach. And armed with this you can really really bore your teacher if you ever find one. There are some great channels on youtube though Christiaans, Denis' youtube stuff one for Bass called 'Talking Bass' which shows you how to actually practice the material presented. 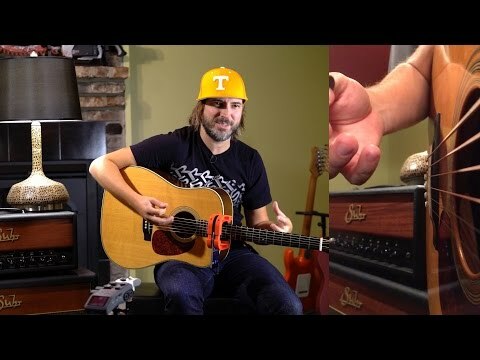 Dave Hamburger's fingerstyle channel. For all the sweeping stuff go to the source Frank Gambale's 'Monster Licks and Speed Picking' where he explained all of the slanting rubbish succinctly and decades ago including lots of the tricks people claim to be 'discovering'. (POST EDITED, shamefacedly this morning. The Feedback you need is from your own body. And the occasional stern rambling from someone who has seen it all before. But yes there are always different strokes, pick angle 'experts' seem to know a lot about stroking too and in their case the correct angle may be a prerequisite to stroking effectively. I can see you really don't like his stuff!lol You must feel the same about him as I do about Tom Hess. He annoys me with his arrogance and the way he condescendingly talks down to people. "The Feedback you need is from your own body. And the occasional stern rambling from someone who has seen it all before"
I agree and disagree. "Feedback from you body" is a pretty ambiguous statement. How we interpret feedback on a subconscious and conscious level is different for each of us. Some people can see as physical action and copy it perfectly first time, others struggle to interpret it. Anyone with a decent amount of teaching experience will have seen just how diverse the learning experience is from person to person. Everyone does not possess the natural ability to "listen to their body", some might find that understanding by processing the information a different way, others need demonstration and directed guidance until they "feel" it the "right" way. You make quite a lot of assumptions in your post above. I'm not a beginner (maybe at Gypsy jazz but certainly not music or the guitar and no doubt I'm just as experienced and qualified as you) and had a few interesting aha moments watching Troy's stuff. Plus I would say he delves into far deeper than Frank did in Monster Licks, as in that video Frank only deals with Frank's techniques which is just one approach on this subject, which in turn is different to Yngwie's, which is different to Eric's, etc. Why do they all pick those 4 notes differently? To mw it's interesting question to ask. I find picking technique fascinating and enjoy seeing how different people solve the same problems or how it varies between styles and why. I've watched almost everything you've recommended over the years and got much from them also. It's not necessarily about hearing new information for me (although of course sometimes I do), but I do enjoy seeing how people present topics from different perspectives which in turn helps my teaching. If thinking on small things like pick angle helps refine my movements and gets me to my goal at the tempo I want, then it was worth the endeavour. I do agree though that none of that should be the primary focus in practice as all elements of musicianship should be worked on and I would agree that there are far more important things to spend the lion's share of time on. I mentioned pick angle here because I would argue that the more accute the angle, the harder it would be to use the rest stroke effectively which is kind of important but that's just my opinion.